A suite of bioactive peptides orchestrates a variety of cellular interactions in the mammalian brain. A new bioanalytical strategy, neuropeptidomics, has evolved from the quest to characterize these important signaling peptides (SPs). The goal of a neuropeptidomics experiment is to characterize the peptides present in an intact brain, brain region, or individual neuron. 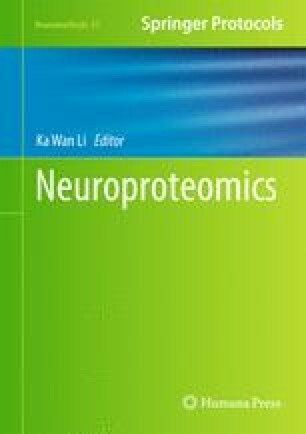 To succeed, a neuropeptidomics measurement needs to deal with the large dynamic range and low abundance of some neuropeptides in a background of peptides from postmortem degradation of ubiquitous proteins. Core components of a successful ­neuropeptidomics study include effective tissue sampling, sensitive and robust peptide characterization, and comprehensive data analysis and interpretation. Mass spectrometry (MS) has become the central analytical approach for high-throughput, high-confidence characterization of the brain peptidome because of its capability to detect, identify, and quantify known and unknown peptides. Robust fractionation techniques, such as two-dimensional liquid chromatography, are commonly used in conjunction with MS to enhance investigation of the peptidome. Identification and characterization of peptides are more complex when neuropeptide prohormone genes have not been annotated. This chapter outlines techniques and describes protocols for three different experimental designs that combine MS with liquid chromatography, each aimed at high-throughput discovery of peptides in brain tissue. Further, we describe the currently available bioinformatics tools for automatic query of the experimental data against existing protein databases, as well as manual retrieval of structural information from raw MS data. The project described was supported by Award Number P30 DA018310 from the National Institute on Drug Abuse (NIDA), and by Award No. NS031609 from the National Institute of Neurological Disorders and Stroke (NINDS). The content is solely the responsibility of the authors and does not necessarily represent the official views of NIDA, NINDS, or the National Institutes of Health.